Elisa (Sally Hawkins) is a mute, cleaning lady who develops a close bond with a mysterious sea creature from the waters of South America. The creature is in danger as government officials look to kill him in use of research. With help from others, Elisa looks to break the creature out, allowing him to live freely. On paper, a romance film with a mute cleaning lady and a humanoid sea creature as the romantic interests may sound too bizarre to be possible to work. 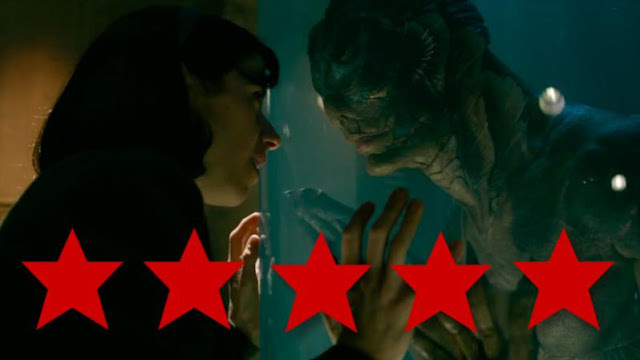 It sounds off-putting and downright weird but in Guillermo Del Toro's latest film, The Shape of Water, it absolutely works. In fact, it works so well that it is the Mexican director's best work within his esteemed filmography. 1960's Baltimore provides a perfect setting for this forbidden romance as it takes us back to a time littered with strife over many different issues like segregation and homophobia that are highlighted in the film. Throw in power-hungry government officials and Russian spies amid The Cold War and you have a boiling pot of tension that looks certain to spill over. Each of these parts plays a huge role in building characters and the situations that our innocent protagonists find themselves caught in. Del Toro alongside co-writer Vanessa Taylor has packed a lot of detail into the film's script with each aspect having a point, leaving no loose ends or wasted plot lines. Del Toro's films have been known for their beauty, both in the story and in production values. From Pan's Labyrinth to Crimson's Peek, Del Toro has shown that he has an incredible eye for detail as each shot he sets up is as meticulous as the rest. From the lighting to set designs, Del Toro makes genuine art with his films as he creates visually stunning set pieces. For this film, the camera is mainly in motion and is rarely stagnant which helps the film feel vibrant and constantly moving forward. Again, this helps in adding as much detail possible to every shot. As Richard Jenkins reads out those final lines and Alexandre Desplat's gorgeous score plays out, you will be sat in an emotional state of happiness whilst in awe of the beauty you just experienced. Sally Hawkins is the star of the film in what is an Oscar-worthy performance as the mute Elisa Esposito. Despite being unable to vocally express her thoughts and feelings, Hawkins provides a powerful performance, showcasing an impressive range. Unlike many contenders during award season, Hawkins doesn't have to shout or deliver long monologues to leave a lasting and memorable impression. Her expressions and mannerisms perfectly capture how she is feeling, whether positive or negative and she makes the love between her and Doug Jones' creature feel genuine. If Hawkins role isn't believable, the film simply fails. Luckily, this is one of the best performances we've ever seen. Hawkins is supported by a truly fantastic ensemble diverse cast, with each character having their own individual problems and wants that factor into the main story. Richard Jenkins and Octavia Spencer play Giles and Zelda, Elisa's closest companions. The two provide an excellent contrast to Hawkins, both being very chatty against Elisa's silence. The characters are incredibly likable and add a perfect amount of humour without overdoing it whilst maintaining the seriousness of the film's situations and settings. In what could've been an incredibly cartoony villain role is the ever-intense Michael Shannon. Shannon borderlines at times on being over the top but it cannot be denied that he is constantly one to be feared throughout the entirety of the film. His unpredictability and short temper create a vast amount of tension and a genuinely frightening villain. Huge credit again must go out to Del Toro's frequent collaborator Doug Jones who plays his non-human role perfectly yet again. Del Toro has created a genuine masterpiece that is equally narratively and visually stunning. Everything comes together perfectly to create an emotional rollercoaster of a film that will leave you feeling incredibly satisfied by the time the credits roll. Del Toro has crafted something truly special with this film and is one that I will never forget. Emotional and beautiful, The Shape of Water delivers on all levels.